The Honor V10 has been leaked quite a few times, and information from official and unofficial sources has circled the internet for the past few months. We’ve known for a while that Honor would hold a global event to launch its new flagship smartphone in London on December 5. Then, Honor announced that the phone would first be made official in China. After that, we brought you an exclusive leak of the specifications of the device. Now, the date of the China launch has arrived, and as promised, Honor has announced the Honor V10 for the Chinese market. The specifications fully match the ones we leaked in our report earlier this month. 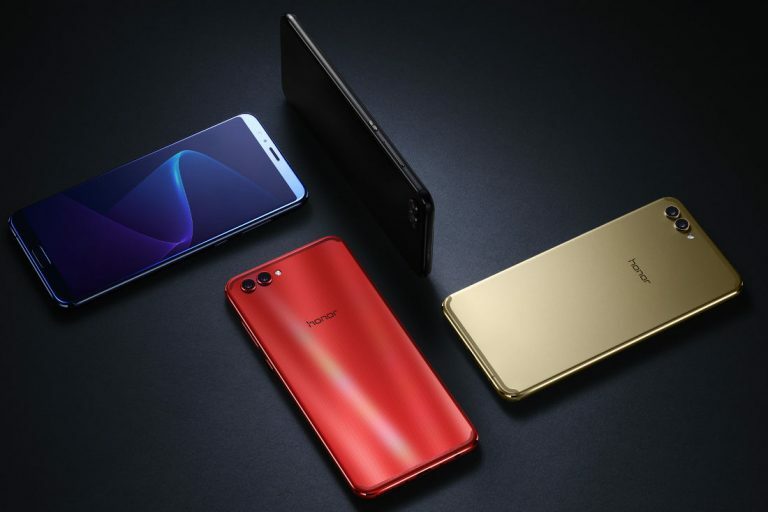 The Honor V10 is similar in specifications to its parent company’s Mate 10 Pro, which was announced on October 16 alongside the regular Mate 10. However, the V10 differs in quite a few aspects from the Mate 10 Pro, and manages to have its own visual identity. So let’s take a deeper look at the device. The Huawei Mate 10 has a 5.9-inch QHD (2560×1440) RGBW LCD with a 16:9 aspect ratio, while the Mate 10 Pro has a 6-inch Full HD+ (2160×1080) AMOLED display with an 18:9 aspect ratio. Both of these phones have glass backs. This is where the Honor V10 distinguishes itself as it is a unibody metal device, similar to the Honor 8 Pro. The Honor V10 has its own identity as in some ways, it is similar to the Mate 10, while in others, it is similar to the Mate 10 Pro. It has a display of the same size (5.99-inch), aspect ratio (18:9), resolution (2160×1080) and pixel density (403ppi) as the Mate 10 Pro, but the type of the display is different. The V10’s display is LCD instead of AMOLED, which means that the effective color resolution of the Honor V10 is higher than the Mate 10 Pro’s AMOLED display, as it uses a RGB matrix instead of a PenTile matrix, but it remains to be seen how the display quality holds up to the Mate 10 Pro’s display. Honor has placed the fingerprint sensor on the front of the device, similar to what we saw on the Mate 10. The device has small bezels just like the Mate 10 series, which means it fits an overall bigger display into roughly the same footprint occupied by its international predecessor, the Honor 8 Pro. In terms of overall design, the V10 is an interesting hybrid of the Mate 10 Pro, the Mate 10, and the Honor 8 Pro. Now, let’s look into its specifications. The V10 is powered by an octa-core HiSilicon Kirin 970 SoC with an i7 co-processor and a dedicated NPU (Neural Processing Unit). The GPU is the Mali-G72MP12, which is ARM’s latest-generation GPU. The device comes in three variants. The most affordable configuration comes with 4GB of RAM and 64GB of storage, and then there are two 6GB RAM variants with 64/128GB of storage. In terms of connectivity, it has a USB Type-C port, Wi-Fi 802.11ac, Bluetooth 4.2, 4G VoLTE, and NFC. It does have a 3.5mm headphone jack, unlike the Mate 10 Pro. It has a dual camera system, and the Leica branding is absent, as expected. It has a 16MP RGB sensor paired with a 20MP monochrome sensor, with a f/1.8 aperture and PDAF, but there is no mention of OIS in the specifications list. The sensor and pixel size are also currently unknown. When it comes to video, the V10 supports 4K video recording. The camera system has an artificial intelligence engine that offers Real-Time Scene and Object Recognition functionality, which means it can automatically choose the best camera settings for any environment or focal point. The front-facing camera has 13MP resolution with AI self portraits, and it is supposed to have face unlock. The Honor V10 has a 3,750mAh battery with Super Charge fast charging technology (22.5W) that is able to charge from 0 to 50% in half an hour, according to Honor. In terms of software, the phone is powered by Android 8.0 Oreo with Emotion UI 8.0 on top. As the phone was announced in China, we don’t have any information yet about which LTE bands are supported. We will have to wait for the international launch on December 5 for that. The Honor V10 comes in Black, Aurora Blue, Gold and Red colors. It is priced at CNY 2,699 (~$409) for the 4GB RAM with 64GB storage version, CNY 2,999 (~$455) for the 6GB RAM with 64GB storage version, and CNY 3,499 (~$530) for the highest-end 6GB RAM with 128GB storage version. The smartphone is already up for pre-orders on Vmall.com, JD.com, Tmall.com, Suning.com, and Gome.com, and will go on sale from December 5. The device will be launched in London on the same day. Our take: At a glance, the Honor V10 definitely seems to be a great candidate for an affordable flagship. It has most of the features of the Huawei Mate 10 Pro, but there are some differences as well. The display type is different; the cameras are different; and there is no mention of water resistance in the specifications list. On the other hand, it differentiates itself from the Mate 10 Pro by including a 3.5mm headphone jack, which is a major plus for consumers, particularly at this price range. Speaking of pricing, the starting CNY 2,699 (~$409) price tag for the Chinese market seems reasonable, and the phone is shaping up to become a strong competitor to the recently-launched OnePlus 5T. The international launch for the V10 is the place where we will learn more about the device, including its international pricing. That’s only a week away from today, so stay tuned! Idrees Patel is a smartphone enthusiast from India. He has been an Android user since the time he got the LG Optimus One in 2011. He has a bachelor's degree in Management Studies. The subjects in which he is interested are mobile processors, real-world UI performance, in-depth camera quality analysis, and many more. Contact: [email protected]developers.com.